Written by エスキューブ札幌. Posted on 2019年2月9日. Filed under SQ-CUBE情報. No comments. Written by エスキューブ横浜. Posted on 2019年2月9日. 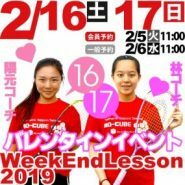 Filed under SQ-CUBE情報, SQ-CUBE横浜, 横浜◎若山忠. No comments. Written by エスキューブ札幌. Posted on 2019年2月9日. Filed under SQ-CUBE札幌, 札幌◎栗山淳喜. No comments. Written by エスキューブさいたま. Posted on 2019年2月9日. Filed under PRO◎田山健司. No comments. Written by エスキューブ札幌. Posted on 2019年2月9日. Filed under SQ-CUBE札幌. No comments.